While authoritarian rule appears to provide stability over the short term, it breeds discontent and affirms the idea that violence is the only way to be heard. On September 23, Egyptian President Abdel Fattah el-Sisi pardoned two journalists from the news network Al Jazeera, ending an embarrassing episode that had haunted Egypt’s military-led regime for nearly two years. Egyptian officials portrayed the decision as part of a routine prisoner release ahead of the Muslim holiday of Eid al-Adha, in which Sisi pardoned about 100 political prisoners for health and humanitarian reasons. It also came days before Sisi traveled to New York to take part in the United Nations General Assembly. Prisoner releases and pardons are common throughout the Arab and Muslim worlds ahead of the two major religious holidays, Eid al-Fitr and Eid al-Adha. They are particularly important in regimes dominated by military strongmen and kings, where judicial independence and rule of law are virtually nonexistent. “While these pardons come as a great relief, it is ludicrous that some of these people were ever behind bars in the first place,” Amnesty International said in a statement after Sisi pardoned the two journalists, Mohamed Fahmy and Baher Mohamed, along with several political activists. The pardons showed how fully Sisi has transitioned into the role of strongman, and how far the Middle East has moved from the early promise of the 2011 Arab uprisings, which toppled then-Egyptian President Hosni Mubarak and other dictators. Sisi is the latest in a line of military strongmen to rule Egypt, since the charismatic Gamal Abdel Nasser overthrew the British-backed monarchy in 1952. 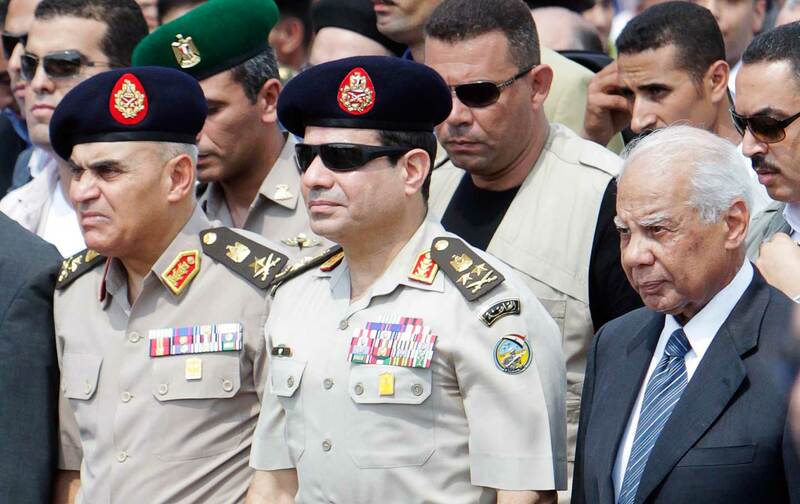 And like the strongmen of an earlier generation, Sisi wanted to look magnanimous before going on the world stage. For a short while, it seemed that the era of rule by strongmen was coming to an end. In October 2011, the Libyan dictator Muammar al-Qaddafi was captured hiding in a drainage pipe near his hometown of Sirte, and he was beaten and shot dead by rebels, bringing his 42 years in power to an ignoble end. His contemporaries were the likes of Saddam Hussein and Hafez al-Assad, military men from poor families and hardscrabble towns who fought their way to the top, riding the wave of revolutionary sentiment that swept the Middle East in the 1960s and ’70s. Their inspiration was Egypt’s Nasser and his Free Officers Movement, who pledged to rid the Arab world of the vestiges of colonial rule. Nasser’s rousing speeches, heard across the region via the newly invented transistor radio, kindled visions of Arab unity. It was a time of upheaval, in which the merchant and feudal elites—the allies of the old European colonial powers—were losing their grip. At first, Saddam, Qaddafi, and Assad appeared to embody a promising new era of reform. But these leaders and others quickly suppressed any opposition, executed their critics, and squandered national resources. Since the 2013 coup, Sisi’s regime in Egypt has received over $30 billion in support from the three Gulf monarchies. But the old ways proved surprisingly durable. Two feuding regional powers, Saudi Arabia and Iran, intervened in Bahrain, Yemen, Syria, and Egypt to prop up, restore or create new strongmen. (Tunisia was the only country that avoided the large-scale violence and political disenchantment that followed the Arab uprisings.) The Saudi regime was alarmed by the fall and subsequent arrest of Mubarak, its longtime ally in Egypt, and the Saudis castigated the Obama administration for abandoning him. But the House of Saud became especially nervous when the revolutions spread to Yemen, on its southern border, and Bahrain, a Shiite-majority country ruled by an oppressive Sunni monarchy only 16 miles from Saudi Arabia’s Eastern Province. That is where most of the kingdom’s oil reserves are concentrated, and it is home to a disenfranchised Shiite minority. The Sauds accused Iran of supporting the Bahrain uprising, and sent troops across the border to help crush the pro-democracy movement. Iran, for its part, was initially enthusiastic about the revolutions that challenged the strongmen in Tunisia, Egypt, and Libya—until an uprising threatened Tehran’s ally, the Syrian dictator Bashar al-Assad, who inherited the role of strongman from his father. So Iran sent money, arms, and military advisers to prop up Assad’s regime, while Saudi Arabia and other Sunni Arab states backed the Syrian rebels. In Egypt, the Sauds were worried by the rise of the Muslim Brotherhood, a populist, Sunni Islamist movement that won parliamentary and presidential elections after Mubarak’s fall. But in July 2013, only a year after Mohamed Morsi, a Brotherhood leader, became the country’s first democratically elected president, the military removed him from power, and soon thereafter Egypt spiraled into a cycle of state-sanctioned violence, repression, and vengeance. The new military-backed government launched an aggressive campaign to suppress all political opponents, hunt down leaders of the Brotherhood who fled after the coup, and undo many of the gains made during the 2011 revolution. After Morsi’s ouster, Islamist militants intensified an insurgency centered in the North Sinai, killing hundreds of Egyptian soldiers and policemen. Many of the militants later declared their allegiance to the Islamic State (ISIS) and its leader, Abu Bakr al-Baghdadi. Sisi, who was Morsi’s defense minister and the coup’s main instigator, was elected president in May 2014 with nearly 97 percent of the vote (he faced a single, obscure opponent). Since then, Sisi has restored many elements of military rule, returned officials from Mubarak’s former regime to power, and issued laws by fiat since Egypt has not had a Parliament for three years. In Sisi, the House of Saud found a new strongman for Egypt. Sisi had served as an Egyptian military attaché to Saudi Arabia, and as he led the crackdown against the Brotherhood, the kingdom became his most important sponsor. The Sauds provided more than $12 billion to keep the Egyptian economy afloat, and they pressed two other Gulf monarchies, the United Arab Emirates and Kuwait, to pledge more aid. Since the coup, Sisi’s regime has received over $30 billion in support from the three Gulf monarchies. In another recording, Sisi sounds incredulous at the sums he and the generals have received from their Gulf allies. “No, no, no! It’s not $8 billion in six months, no!” he says, before one of his deputies convinces him that they have received a total of over $30 billion. “May God continue providing!” Sisi responds. Today, Sisi’s regime can continue its crackdown with impunity partly because the United States and other Western powers made clear that they favor stability over democracy. Much of the West accepted the coup and has remained largely silent about the sham trials and mass death sentences being handed down by the Egyptian judiciary. The United States provides Egypt with $1.3 billion in military aid each year, but it has been reluctant to use that as leverage against the Egyptian regime. Neither President Obama nor Secretary of State John Kerry has substantively criticized Sisi’s dictatorship; after Morsi was sentenced to death earlier this year, the most severe criticism the State Department could muster was a tepid statement expressing its “deep concern.” And while Sisi has found an alternative to US aid in his growing reliance on Saudi Arabia and other Gulf states, they cannot make up for the advanced military equipment that Washington provides. In August, the Cairo Criminal Court sentenced the journalists to three years in prison for disseminating false information “with the intention of tarnishing Egypt’s image and reputation.” They were cleared of the charges of belonging to a terrorist organization. In its verdict, the court argued that Al Jazeera is “part of an international conspiracy against Egypt.” While Sisi and others in his regime hinted that they viewed the trials as a source of international embarrassment, the judiciary reflected the strongman’s tactics of reining in a critical press and crushing any dissent with the threat of long prison sentences. The strongman often insists that revolutions are foreign plots, instigated by saboteurs like Qatar and its Al Jazeera journalists. In this view—which was voiced by Mubarak, Qaddafi, Assad, and virtually every other dictator who faced an uprising in 2011—revolutions are not inspired by disenfranchised populations, but rather by foreign powers. Islamists view the Egyptian coup and subsequent crackdown as a signal that election results will not be respected. In mid-June, an Egyptian court upheld the death penalty against Morsi, the first Muslim Brotherhood leader to assume the presidency of an Arab country. He was initially sentenced to death in May, along with more than 100 co-defendants, for taking part in an alleged prison break. It was the latest in a series of sham trials and mass death sentences decreed by the judiciary since the coup. Beyond Morsi’s fate, the mass death sentences send a dangerous signal to Islamists throughout the region: The only way to achieve political power is through violence. The Brotherhood’s recent experience in Egypt shows that authoritarian and secular forces, which often fare poorly at the ballot box, will mobilize to undermine the Islamists before they have had a chance to rule fully. The Muslim Brotherhood is the oldest and most influential Islamist movement in the Arab and Muslim worlds; it has inspired branches and affiliates throughout the Middle East. In the decades leading up to the Arab uprisings of 2011, Islamist parties across the region renounced violence and committed to participating in electoral politics. But now, Islamists view the Egyptian military’s coup and subsequent crackdown as a signal that election results will not be respected. The process can spiral out of control, as it did in Algeria in 1992, when the Islamic Salvation Front was on the verge of winning parliamentary elections, and the military intervened to cancel the second round of voting. That coup set off an eight-year war civil war that killed more than 100,000 people. Many in the Arab world and the West have failed to grasp this danger: While authoritarian rule appears to provide stability over the short term, it breeds discontent and affirms the idea that violence is the only way to be heard. It also sets up a dichotomy favored by Sisi, Assad, and the strongmen of an earlier generation, where Arabs are stuck between only two choices: authoritarian and nominally secular rule, or life under Islamist extremists like Al Qaeda or ISIS. Rulers who demonize all Islamists and other opponents as terrorists who must be suppressed nurture a self-fulfilling prophecy, allowing them to repeat the pattern of repression that leads to more radicalization. For the strongman to keep power, there can be no other choice.